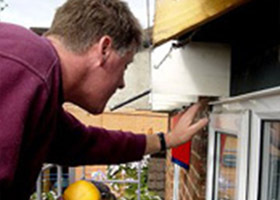 Alpines products are designed to protect, decorate, ventilate and insulate your property. We are committed to delivering excellence and innovation in our products as well as our standards of workmanship. We only use quality materials, and all of our work is guaranteed for 10 years. To minimise inconvenience and provide a safe working environment for our fitters, we use the Easi-Dec scaffolding system wherever possible. 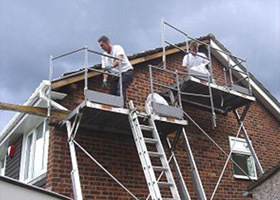 This is quickly assembled and adjusted to suit most properties, and avoids any security worries of leaving normal scaffolding around a property. 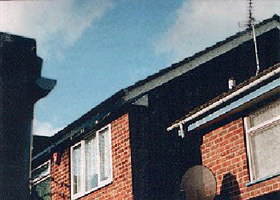 The streaking shows that the felt edge under the tiles has probably perished and needs replacing - the felt is there to ensure rainwater sheds off the roof into the guttering. All old timber/asbestos is taken off, and the perished felt is cut back. It is cheaper to just cover over the old wood, but this would produce a low-quality finish and is likely to cause extra rot in the future. You don't want to pay twice! We do it right first time. 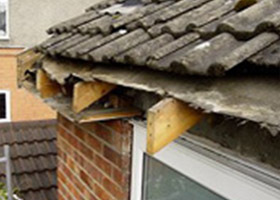 Fixing new fascias and soffits direct to the existing timbers would lead to a poor quality finish. 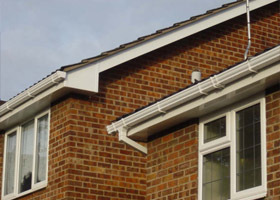 Using plumblines and upvc 'sprockets', our skilled tradesmen ensure that the supports for the new fascias and soffits are mechanically sound and perfectly in line. replaces damaged felt edge and will not rot again. 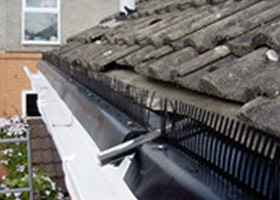 'comb' stops birds getting under tiles. ventilation meets Building Regulations without needing vents in the soffits. No vents in our soffit makes for a neater finish, as does the lack of sealant on the brick line - we take the time and trouble to fit precisely to the brickwork. Daylight is also showing between the gutter and fascia of next door.